When I got my first pair of Converse shoes back in college they freaked me out. The soles were so thin compared to anything else I had worn in many years. I left the house to walk to class and was amazed at how I could feel the different textures that I was walking on. I could feel the cracks in the sidewalk. After wearing only the Converse for a few weeks I put on a pair of my old sneakers. Suddenly it felt like all the floors were covered in two inches of rubbery foam. Saturn Gravity Boots strike again! Wow! I wonder if the other comics have had connections to past comics….. Wait! The first one this week had a reference to his funky chair at work. What about the other three? nothing better to wear to a doctors appointment than gravity boots. Besides pants. I hear they ask funny questions when you don’t wear those. soles were so thing–> thin i presume? Didn’t I refrence the saturn gravity boots im the last comic? Biff, did I insipire you to do this…kind of? I don’t care who inspired what. I just want a pair of Saturn Gravity Boots of my own. Remember those aqua socks things, basically rubber socks, they had thin soles! @Chris – I knew a guy in high school that wore aqua socks to school everyday. Man…that’s like the opposite of orthopedic shoes. I wear hiking boots whenever I wear shoes. I have bad ankles so it’s much better support, and you can be on your feet all day and not notice it nearly as much. I go through the same thing when I put on sneakers. They just feel so thin and flimsy. I don’t understand how people do that. I know that feeling! I’ve had two pairs of Vans Classic shoes (the canvas ones similar to converse), and they have the same feeling to them. It’s really cool to feel all of that underneath your feet. I need to get a pair of either Converse or of the Vans again, now. My tabi boots are like that, but it’s not the thickness of the soles, it’s the amazing pliability of the rubber. It is indeed a strange feeling when you can feel every crack in the driveway, like you’re not wearing shoes at all. Two days ago is the incident that inspired the orange juice pool. I know that both of those are a stretch, but it’s the best I’ve got. I wear combat boots every day… Would that make me strange? Those are pretty absurd shoes! My 2nd pair of Nikes were my favs, they were so flexible they were like wearing a second skin. I had a pair of aqua socks once. I wore them on vacation to a lake and the lake ate them. If you live in California, then yes wearing combat boots would make you weird. 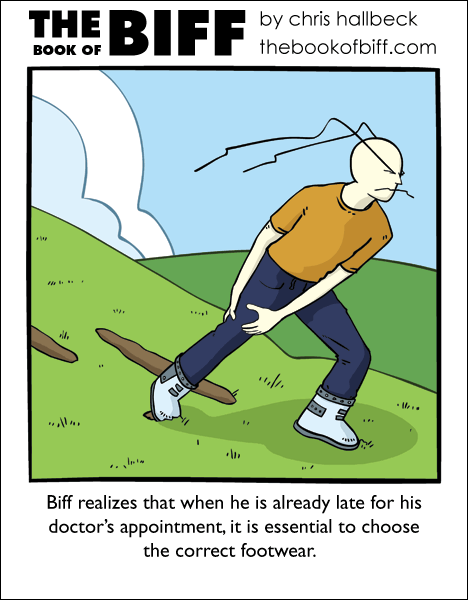 I would hate to be Biff’s doctor. If being cut in half by a piece of paper is a minor thing, what do you go to the doctor for? Reminds me of wind waker link. He could hardly walk with his iron boots on. I’m surprised he could, he is only 11. I wear burkin stocks all the time. Concerning the converse shoes, same here. When trying on shoes, i had 1 of 2 newbalance models (i gots flats feet). I had the model like my old one. (except bigger harder faster stronger…) or the ones with ‘cushioning’. i was swimming in those, my foot goes forward then the shoe gets pulled along, and the shoe goes down then the foot. Tuesday’s comic might be a referrence to 184-Ice. It’d be helpful if Chris could verify some of these guesses. I need 6E, the widest they are made. AND i think I have flat arches too. Foot problems run in my family. Perfectly rational. It is never healthy to visit a doctor. They’ve got all those sick people there. IM WITH YA MASKED MAN! When I am roofing, I wear thin volleys, so I can grip and feel what I am walking on. When I am working underground, I wear boots that have soles over an inch thick. I feel taller, but it is soooo much harder to walk. There is a guy at work with aus size 15(us16) feet. haha, his boots are massive, almost like clown boots. All I own are boots. A pair of Navy Flight Deck boots for general walking around and working in, a pair of field combat boots that are nicely polished for interviews (My calves are too muscled, so laced properly they cut into my calves), a pair of Harley Davidson Motorcycle boots for looking cool, and a pair of Doctor Scholl’s for usually working (not haevy work, just office or lab work) or whatever. I can run the best in the flight deck boots. I haven’t had a pair of tennis shoes in about 3 years. I can’t imagine they would be too comfortable anymore. Anyway, my sister has the exact same shoes, sames size, same make, but just slip on ones with elasticated stuff instead of velcro. BUT, Mine are comfier, dont crush my feet and are actually bigger. I think i may have stretched them as i grew. Because they are bigger than my pair of size 8 shoes. heh, almost forgot to click “submit comment” just then. I’m walking barefoot most of the time (including times where it’s below freezing outside). Always feels really strange when I have to wear shoes for some reason.